Lohagarh Fort is located at Bharatpur in Rajasthan, India. It was constructed by Bharatpur Jat rulers. Maharaja Suraj Mal used all his power and wealth to a good cause, and built numerous forts and palaces across his kingdom, one of them being the Lohagarh.Monuments in the fort include are Kishori Mahal, Mahal Khas and Kothi Khas. Moti Mahal and towers like Jawahar Burj and Fateh Burj. 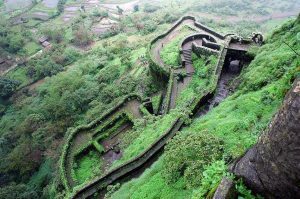 The Bharatpur Fort of Lohagad is one of its kind Fort.Built in 1730’s today most of the fort is occupied by government offices and a museum. One thing which strikes one immediately about the architecture is the lack of ostentation; Lohargarh is definitely much simpler as far as carvings, paintings and other frills go. With its emphasis on security and security only, there’s almost no room for unnecessary ornamentation. It is modest and functional.Inside the fort are three palaces, Mahal Khas, Kamra Palace and the Palace of Badan Singh. Some interesting monuments in the fort are Kishori Mahal, Mahal Khas and Kothi Khas. Moti Mahal and towers like Jawahar Burj and Fateh Burj were erected to commemorate the victory.Between the Museum and the main entrance, the Ashtadhatu Gate, is the Nehru Park. It is a pleasant place to sit and enjoy the breeze. Lohagarh Fort, which was constructed by Jat ruler Maharaja Suraj Mal in the 18th century, is one of the finest architectural monuments in Rajasthan. Though the fort is not associated with richness, it depicts an atmosphere of strength and glory as it once featured a highly creative defense system that protected it every time. It was in fact named as the Lohagarh Fort, or Iron Fort, due to its invincibility at the time when British attempted to conquer it.